It sounds like the beginning of a brain teaser: “How is it possible for someone to graduate from high school and college at the same time?” There’s no trick, however – other than a little hard work. Just ask Rachel Logsdon. Logsdon spent her freshman year of high school as a traditional student, then she was homeschooled for a year. 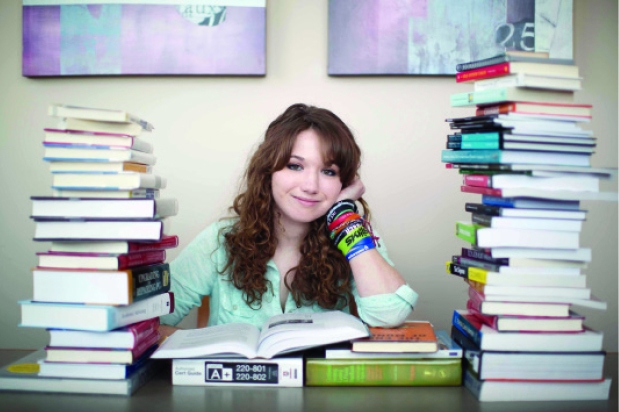 Upon entering her junior year, she was ready for a change. Logsdon considered returning to the high school she had attended previously, but her mother suggested another option: Ivy Tech Community College dual credit courses. Dual credit allows students to earn high school and college credit simultaneously. Logsdon met with advisors at Ivy Tech who pointed her toward a general studies program that also satisfied the requirements for her to earn a high school diploma. Logsdon says the idea was a little intimidating at first, but her mother helped her anticipate what she would encounter in the college environment. In addition, Logsdon found that her age really wasn’t an issue with her professors and other students – primarily because they often didn’t discover it until halfway through the semester. Even then, she wasn’t treated any differently. Logsdon also credits the advisors at Ivy Tech for assisting her in understanding the requirements for earning a degree. For example, they helped her determine what classes she needed and make the switch from being a dual credit student to a degree-seeking student, a necessary step toward receiving her associate degree. Thanks to their help, she will complete her degree in August. She then plans to transfer, pursue a bachelor’s degree in animal science, and eventually go to veterinary school. Altogether, she doesn’t mind serving as a unique example of how it is possible to graduate from high school and college simultaneously. “There’s really no downside to getting extra college credit,” she says.